U.S. Patent No. 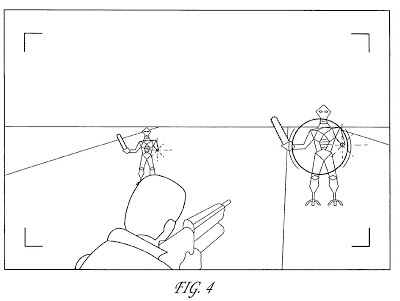 9,295,912 (the ‘912 Patent) describes a method for a game’s aim assist in selecting a target when there are multiple targets in view. The target is selected based on the distance between each potential target on screen and the user character’s center of focus. Once a target is selected, the game automatically adjusted the aim towards the chosen target. The player still has the choice about who and where to aim. Aim assist only tries to compensate for the limited range of motion offered by a joystick. People associate aim assist with shooters, but action RPGs will also use aim assist to help players swing swords or cast spells. It does not matter if a player is attempting to aim a gun or a sword, the method described in the ‘912 Patent is meant to help the player when blindly aiming at a group of enemies. By adjusting the aim to select a target, the player will know which enemy he/she is shooting or hitting. Aim assist can be very helpful in frenetic games where the speed of the gameplay prevents players from carefully aiming. Methods for game aim assist are provided. In electronic games, a game player may control the actions of a game character within a game environment. The game environment, which includes a focus area, may be displayed from a perspective of or with respect to a game character. During game play, one or more objects may be detected in the focus area. One of the objects may then be selected based on the distance between the object and the center of the focus area. The aim of the game character is then automatically adjusted toward the selected object, which allows the game player to direct an attack action on the object. 1. A method for game aim assist, the method comprising: executing instructions stored in memory, wherein execution of the instructions by a processor: generates a display of a perspective of a game environment, the generated display for a display device and including a defined focus area having one or more objects available for targeting, wherein the defined focus area has an area that is less than the display of the perspective of the game environment; selects an object from the one or more objects available for targeting in the defined focus area, wherein selection is based at least on a distance between each of the one or more objects and the center of the focus area; and automatically adjusts the aim of a game character, from an initial position in the display to a second position in the display, the second position being directed towards the selected object, wherein the selected object is indicated by a targeting display; and receiving an instruction via controller to activate a weapon of the game character, wherein the weapon is directed in accordance with the automatic aim. Issued July 17, 2016, to Amazon Technologies, Inc.
U.S. Patent No. 9,393,486 (the ‘486 Patent) relates to U.S. Patent No. 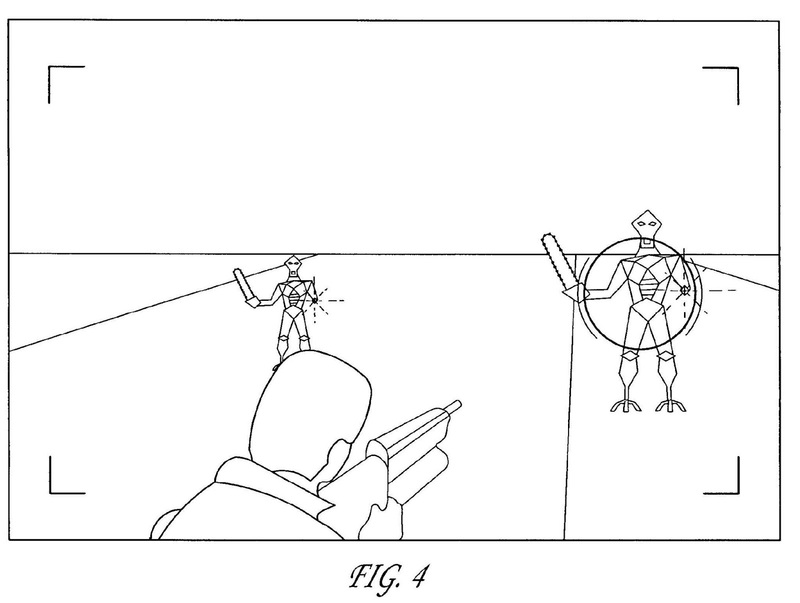 9,409,083 (the ‘083 Patent) titled Spawning new timelines during game session replay, which we covered last week. 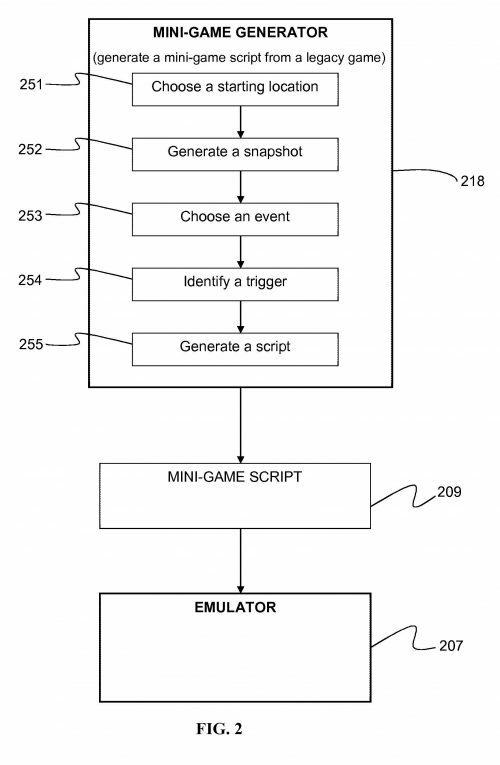 The ‘083 Patent describes a method for allowing players to “step into” a replay and restart a session from that given point. The ‘486 Patent builds on the ‘083 Patent by describing a system to send out a notification to all players involved in the previous session. The notified players can either participate or spectate the session. Not all players from a previous session are required to replay a previous session. 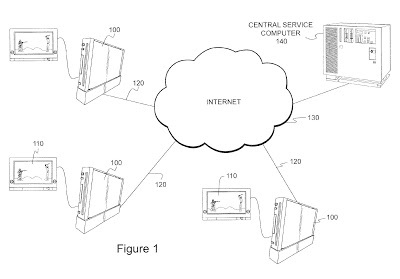 The ‘486 Patent also describes a system to allow a person to replay a multiplayer session without needing the other players. The system creates a profile based on the behavior of a given player. If a single player wishes to replay a past multiplayer session, then AI bots will take over missing human players. AI will use the player’s profile to inform how the character should behave in a given circumstance. A game system in which game sessions may be recorded and saved as game records. A previously recorded game session may be selected and replayed, and players may step into and assume control of respective game characters during the replay. When a player steps into and takes control of game a character during replay of a game session, a new timeline is spawned from the original timeline, and a new game record corresponding to the new timeline is generated and stored. Players that were involved in a previously recorded game session that is being replayed may be manually or automatically notified that the game session is being replayed. The notification may occur upon initiation of the replay and/or when a new timeline is spawned. Notified players may view the game session without participating, or may take control their respective characters to participate. 1. A system, comprising; one or more computing devices configured to implement a game system configured to: store a game record comprising a game session involving one or more game characters acting within a game universe, wherein the game characters are associated with one or more of a plurality of players; begin a playback of the game session as recorded in the stored game record to at least one client device; and for at least one of the one or more game characters involved in the game session being played back, send a notification to a player associated with the respective game character via one or more communications channels, said notification indicating to the player that the game session involving the player’s game character is being played back. Issued August 9, 2017, to Amazon Technologies, Inc. Traditionally, to restart a multiplayer session requires that all the players begin anew. For co-op multiplayer games, restarting means starting from a point designated by the level designers. Restarting from a designated point can become frustrating when fighting a challenging boss. U.S. Patent No. 9,409,083 (the ‘083 Patent) describes an alternative method. 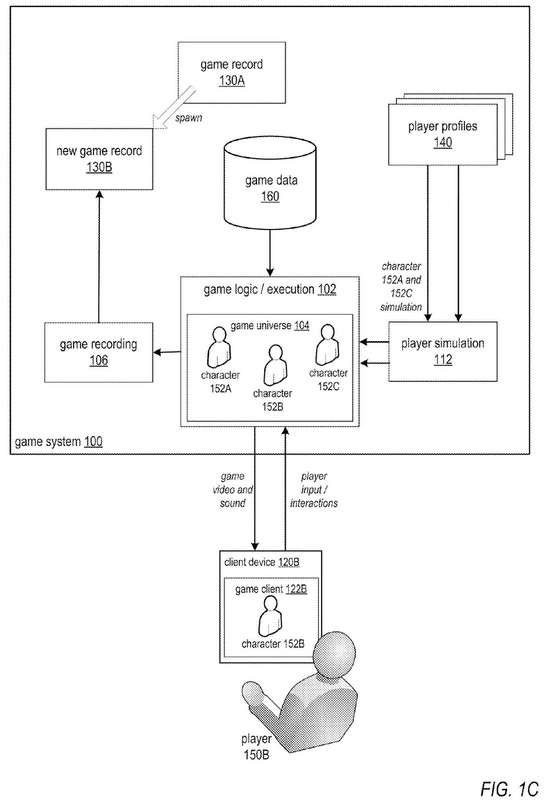 Every gaming session is recorded by a game using the ‘083 Patent system. If the players were to die, the game would use the record to show the players a replay of their last session. The players can watch the replay and see the exact moment where things went wrong. Players can then decide to “step in” and start a new session from that point, creating a new timeline or universe that diverges from the original game session. The new (altered) gaming session will create a new record from which players can repeat the process. A game system in which game sessions involving one or more players may be recorded and saved as game records. A previously recorded game session may be selected and replayed. However, in addition to providing a static replay of the game session, the game system may allow one or more players to step into and assume control of respective game characters at any point during the replay of the game session. When a player steps into and takes control of game a character during the playback, a new timeline is spawned from the original timeline with potentially different outcomes, and a new game record corresponding to the new timeline is generated and stored. 1. A system, comprising; one or more computing devices configured to implement a game system configured to: store game records comprising previously played game sessions, each game session involving one or more game characters acting within a game universe along a game session timeline; receive selection input from one of one or more client devices, said selection input selecting one of the stored game records for playback; begin playback of the game session as recorded in the selected game record to at least one client device; receive game input from a game client instance on one of the one or more client devices, said game input causing an action by one of the one or more game characters within the game universe; and in response to said game input, spawn a new game session timeline from the game session timeline as recorded in the selected game record and generate a new game record for the new game session timeline. 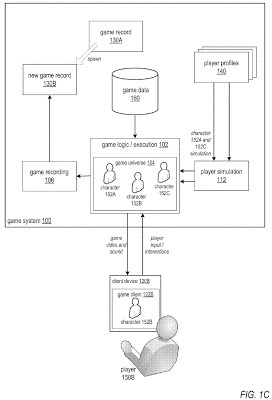 Issued February 14, 2017, to Nintendo Co. Ltd.
A huge draw to online games, especially MMORPGs, is the impact one person can have on another person’s game. Games like World of Warcraft, Second Life, or Minecraft are built around the concept of people interacting in an online digital world. Minecraft allows players to interact with features built by other players. To affect the world in these multi-player games, all the players inhabit the same world. Interacting with all the players can both be a positive and a negative experience. What if a player wants to play a single-player game but still have other people affect the game world? U.S. Patent No. 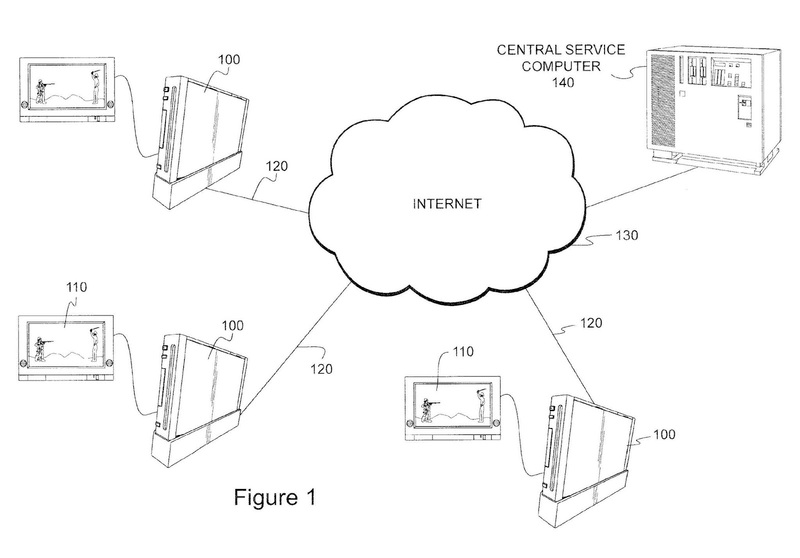 9,566,503 (the ‘503 Patent) describes a method for a massively single-player online game. According to the patent, the game will be a traditional single-player game, but every player occupies the same digital world. Players will not be able to see or interact directly with other players, but the actions of a player can affect others by changing the game world. For example, a player could build a house in this digital world. A second player would be able to see and interact with the house, but could not see or communicate with the person who built the house. The ‘503 Patent sounds similar to the kind of multiplayer experience found in the Dark Souls games. Dark Souls is primarily a single-player game but has a few multiplayer features. Players in Dark Souls can invade another player’s game, leave “helpful” notes in the world, or summon a friend to defeat a demanding boss. Demon Souls, the predecessor to Dark Souls, would alter gameplay depending upon world and individual character tendencies. The ‘503 Patent describes a game where foreign players affect the game world more directly than what happened in Demon Souls, but also more isolated than that of Dark Souls. 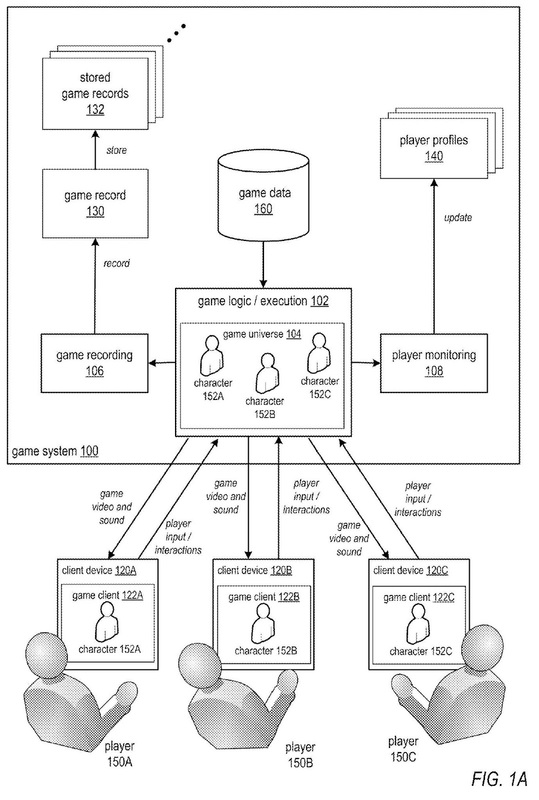 A method and apparatus that allows a player to play a massively single-player online game without directly interacting with other players, while affecting and being affected by other players playing the online game. 1. A method for playing a massively multiplayer online game that provides a massively multiplayer-affected shared game experience without requiring interaction between human-controlled player characters, comprising: simulating a virtual game environment using an online server processor; establishing connections between human players and the online server processor to establish respective game sessions which include player characters that interact with the simulated virtual game environment under direct control received from said human players over said established connections; storing, with the server processor, updated parameters related to the game sessions being played by the human players, said updated parameters related to changes to the simulated virtual game environment caused by massively multiplayer-controlled player characters interacting with the simulated virtual game environment; in response to the updated parameters, using the processor to simulate changing game conditions within the simulated virtual game environment, the changing game conditions dynamically changing over time based on interactions of massively multiplayer-controlled player characters with the simulated virtual game environment to thereby reflect said massively multiplayer-controlled player character interactions with the simulated virtual game environment; establishing a connection between an additional human player and the server processor to establish a further game session which includes a further player character directly controlled by said additional human player; and using the server processor, displaying, in the further game session played by the additional human player, game images according to the simulated virtual game environment and changing game conditions simulated in accordance with the updated parameters thereby exposing the additional human player’s controlled player character to the effect of changing game conditions reflecting said massively multiplayer-controlled player character interactions within the simulated virtual game environment, said additional human player’s controlled player character being at the same position in the simulated virtual game environment and at the same time with the simultaneously-online human players’-controlled player characters, without allowing said additional human player’s controlled player character to see or interact with the other simultaneously-online human players’-controlled player characters. Issued July 18, 2017, to Sony Interactive Entertainment Inc.
Classic console games are known for being challenging and lengthy. Developers designed the games for children who could only buy a limited number of games but had all summer to play. Playing a classic game as an adult can be challenging due to time limitations. U.S. Patent No. 9,707,476 (the ‘476 Patent) answers this problem by transforming the classic game into a mini-game that can cover all the classic moments from a game. First, the ‘476 Patent will choose a starting location from the classic or legacy game for which a snapshot is generated. Then an event from the legacy game is chosen and tied to a trigger. Finally, a mini-game script is generated based on the snapshot and chosen event which is sent to the emulator, ready to be played. The patent describes a method for multiple events to be selected with multiple triggers. It is only upon a player hitting a game-ending trigger that the script will send game-ending instructions to the emulator. Potentially, the ‘476 Patent describes a method that would allow a person to play through Final Fantasy 7 in an hour without missing any crucial events in the game. A starting location for the mini-game is chosen in the legacy game state. A snapshot is generated of that location. Once the snapshot is taken, trigger events are identified. Triggers corresponding to the trigger events are identified. 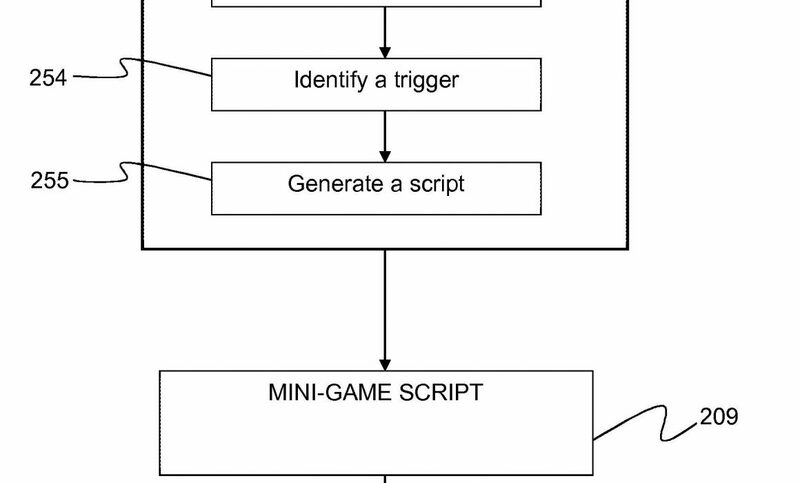 A mini-game script is generated using the snapshot and triggers. 1. A non-transitory computer readable medium containing executable instructions and data for a mini-game configured to be implemented on an emulator operating on a network, the instructions and data comprising: a) a snapshot of a starting location for the mini-game within a legacy game execution state, wherein the snapshot includes saved data corresponding to the legacy game execution state of every device being emulated by the emulator at a designated time during emulation of a legacy game that the emulator can use to start the mini-game; b) data representing one or more identified triggers that correspond to one or more events within the legacy game; and c) a script for the mini-game generated from the snapshot and triggers.